Taken from the French “bon vivant,” meaning “the good life,” Brewery Vivant is inspired by the Old World traditional brewing styles of Europe. More specifically the region of Wallonia in south Belgium. Expect to see a range of Farmhouse ales, saisons, and Belgians. Farm Hand is a house favorite, a sweet but tart traditional farmhouse ale. Big Red Coq, a cheeky name inspired by the rooster insignia of Wallonia is delicious and malty American red ale. Food fare backs up the European brewing techniques with a menu that would be well suited to a home cooked meal in the Belgian countryside. All of this is packed into a brewery converted from a funeral home chapel. Beautiful stained glass windows, polished hardwood and iron chandeliers grace the taproom. 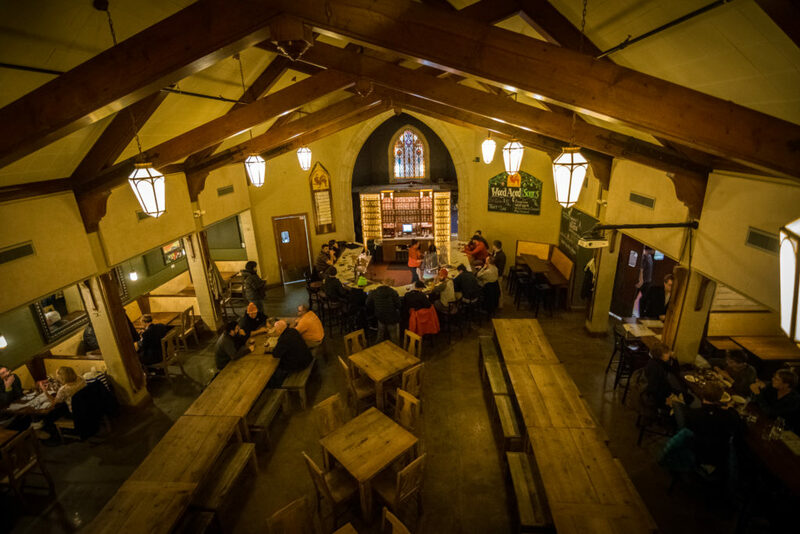 Sit up at the “altar” turned bar for some fresh Michigan craft. The namesake for this brewery comes from the highway it sits along. Route 50 West heads out of Cincinnati and shoots clear across the country. The brewery gives homage to this epic road, drawing its inspiration of a road trippin’ adventure across America. Entering their taproom you’ll pass by an orange VW bus to help stir your sense of wanderlust and prepare you for the craft beer journey inside. Brews are churned out of Fifty West with a nod to historic, adventurous, and cinematic stops along the highway. Trees of Tahoe Pale Ale is an awesome well rounded pale with a great balance of citrusy notes and hoppy flavor. A personal favorite, Gunnison Black IPA is deceivingly dark in color but light, crisp and hoppy and extremely drinkable. A perfect representation of the Black Canyon of Gunnison in Colorado, which it references. 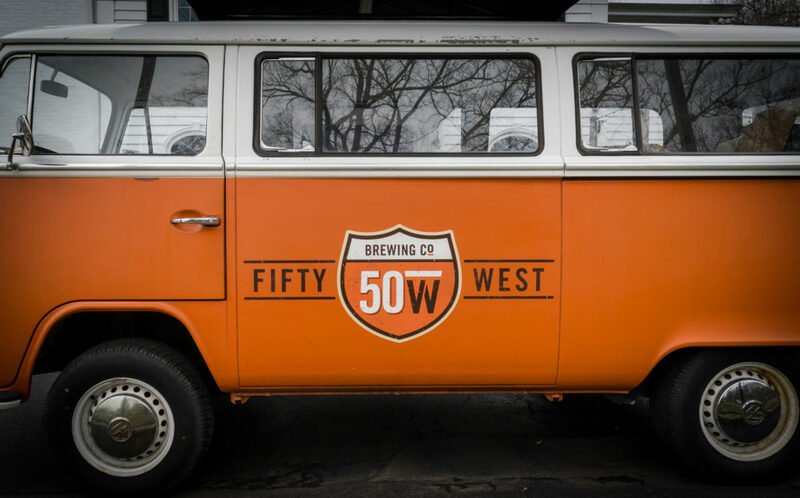 To get all the deets on Fifty West check out this article: Exploring America One Beer at a Time: Road Trippin’ With Fifty West Brewing Co.
One of Indy’s most acclaimed breweries also honors that great big ball of fire in the sky. 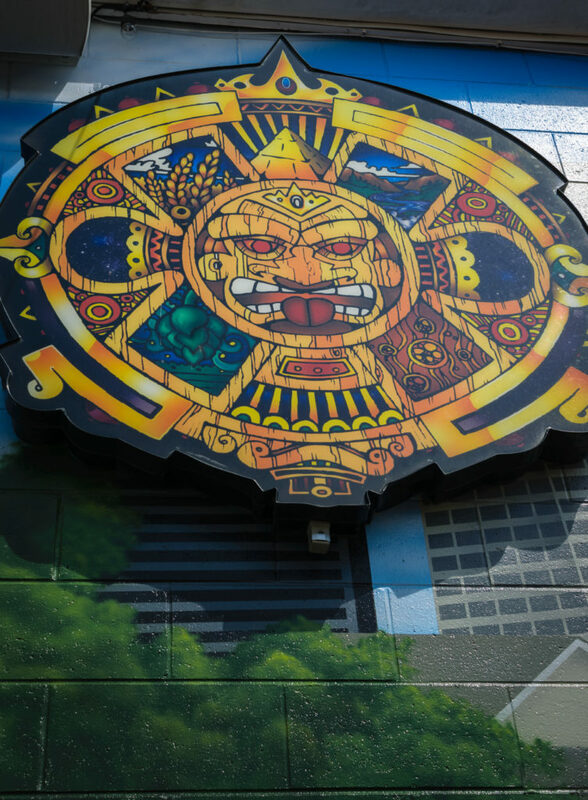 You can’t miss Sun King as you pass down College Ave, a giant depiction of the Mayan Sun God stares out at the Indianapolis skyline from the side of the brewery’s taproom, its motifs altered to represent the elements of brewing beer. Sip on Sunlight, a multiple award winning beer, it is a refined and well balanced cream ale with crisp, clean flavor and a rich and smooth mouthfeel. Osiris is a West Coast style IPA packing lots of hoppy power with a finish rich with undertones of fruit, citrus and pine. Sit out on their big outdoor patio or inside their spacious and naturally lit taproom and catch some rays. 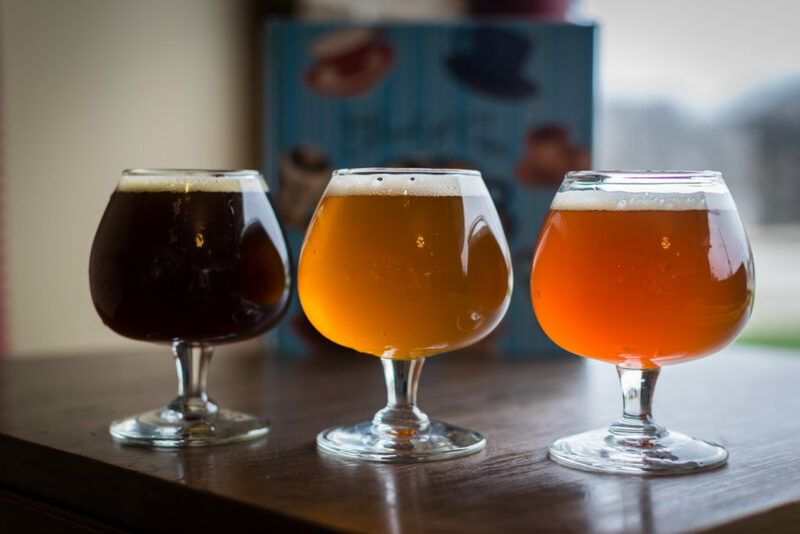 Brite Eyes combines the best elements of a hip coffee joint and craft brewery into one. In their corner downtown location in Kalamazoo this popular little locale is perfect for watching the world go by whether you’re sipping coffee, tea, or beer. Started by lovers of good tea, beer, and coffee you’ll often find elements of each in some of their brews. Rooibos Reserve is a rich amber ale infused to perfection with rooibos tea leaves. A craft concoction I hadn’t experienced anywhere else. Meanwhile, Maple Walnut utilizes the breweries coffee brewing chops to source local grounds into this strong porter. Touches of maple syrup add a delicious balance of sweetness on the finish. The Windy City has a lot of top notch breweries but you’d be hard pressed to find one with the unique quirkiness of Alarmist. A celebration of the flawed human psyche each beer references fears, embarrassments and neurosis we all experience. Pantsless is an Alarmist flagship and one of their first creations. An American style Pale Ale it blends big hoppy flavor with undertones of lemony citrus and grapefruit. Phobophobia or “the fear of fear itself” is an all day drinking Belgian style table beer. Subdued hops mingle with notes of biscuit and spice. A flight of beer at Alarmist is always a delicious and sometimes comical trip through the human mind as you learn the backstory behind each beer name. Check out our full coverage of Alarmists here: Sound the Alarm! 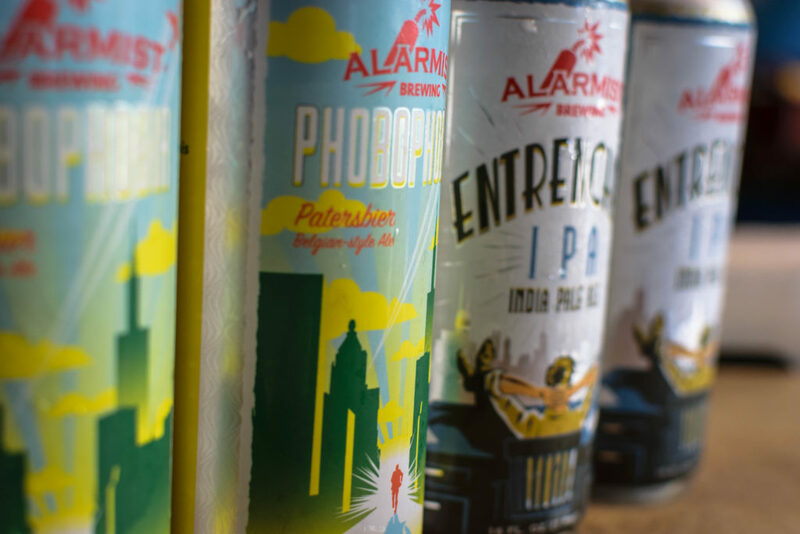 Quirky, Delicious Beer at Alarmist Brewing Co.
Nice article on the mid-west breweries. The links seem to be broken as you get a forbidden error when you click on them.